On Wednesday, Nov. 19, the Traditions Commission presents “An Evening with John Mulaney” at 8 p.m. in Goldstein Auditorium. Tickets are available at the Schine Box Office beginning Oct. 29, and cost $5 for students and $7 for faculty/staff. This is a reschedule of the show originally planned during Orange Central. Anyone who still has their ticket for the Oct. 11 show and would like to attend the Nov. 19 show needs to visit the Schine Box Office to exchange their old ticket for a new one. “The Traditions Commission E-Board is thrilled that we could reschedule John Mulaney’s show and still bring his comedic act to campus,” says Regina King, a senior and president of the Traditions Commission. 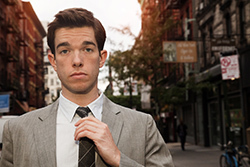 Mulaney was named one of Variety’s 10 Comics to Watch in 2008, the same year he began working at Saturday Night Live. In 2009, Mulaney released his first special, “The Top Part,” and in 2012 released his second Comedy Central Special and album, “New in Town.” His new TV show, “Mulaney,” premiered on FOX on Oct. 5. For more information, contact Courtney Jones, assistant director in the Office of Student Activities, at cejone02@syr.edu or 315.443.2718.